Package can also be re-quoted for smaller or larger family group or on individual basis. Please inquire. Arrival into Ponta Delgada, transfer to your hotel. Rest of the day free at leisure, dinner at your hotel and overnight. Welcome to the enchanting side of the green island, by visiting the gardens of Furnas village. Journey into this diverse gardens and hear the sounds of the earth walking through natural and misty noble corridors. Enjoy lunch with the traditional meal – “Cozido”- also known as Mother Nature’s crock pot that is found nowhere other than Lagoa das Furnas area (a major geothermal and volcanic hotspot) in which large pots are buried underground for six hours, and cook a tasty stew meal by volcanic steam. The dish features pork, beef, chicken, sausage and vegetables. Watch as the pots are being hauled up from the cooking holes. Next, Terra Nostras Garden will bestow you with special moments of synergy between man and nature, a walk through a real life fairy tale. With camellias between hands, the way back will be completed by the north coast views and stops at Vieiras Pottery Factory, Agua D’Alto Waterfall, and other magnificent viewpoints along the way. Today, after breakfast, board your jeep to visit the volcanic complex of Lagoa do fogo which will give you the chance to know the central part of the island? First, a stop along the way of Baleiros Viewpoint, then arrive at the top of the mountain, short stop at Caldeira Velha to admire the magnificent view of the “Lagoa do Fogo” (Fire Lake); the one lake on the island in which you encounter nature in a pure state and view of the island at an altitude of 900m. 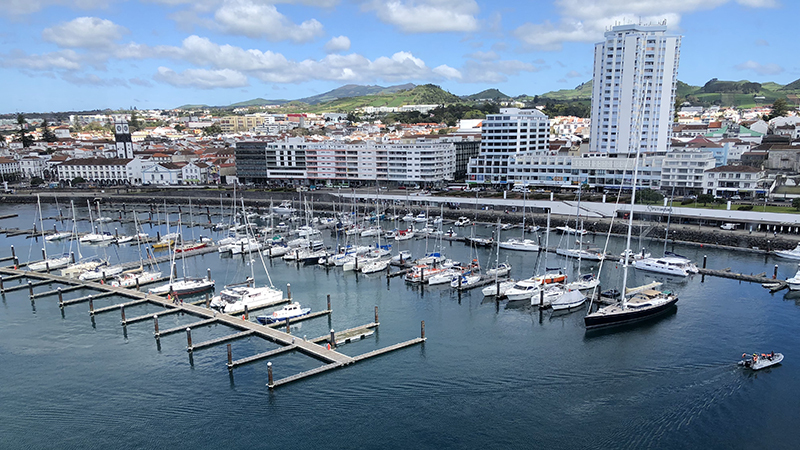 Return to Ponta Delgada rest of the day at leisure, dinner and overnight. After breakfast head out to the countryside – in the rural area of Quinta das Raiadas beside the church of Ginetes Escalvado. Short walk to the old fountain “Fonte do Sapateiro” Visit to the ethnographic centre of Quinta das Raiadas. Visit the farm and orchard, where you can milk a cow. House of the bread (explanation and participation on how to make bread, local handicrafts and how to prepare a lot of traditional food). *Tasting: Taste a variety of local produce including cheese, marmalade, pate and traditional biscuits. Morning free at leisure – perhaps enjoy a kayak or canoe excursion OR for the more adventurous – propel yourself down caves for a different look of the island, on one of our canoeing tours. After lunch (not included) get ready to be transferred by car off shore (20min drive) for your afternoon sunset cruise! Welcome aboard the fascinating world of yachting and the opportunity to enjoy this beautiful island by water, exploring the island with a unique experience. Sail through the crystal waters of the Azores Islands with a skipper. Fully equipped crewed sailboat charters, for unforgettable sailing holidays await you! Return to land, transfer to your hotel, dinner and overnight. 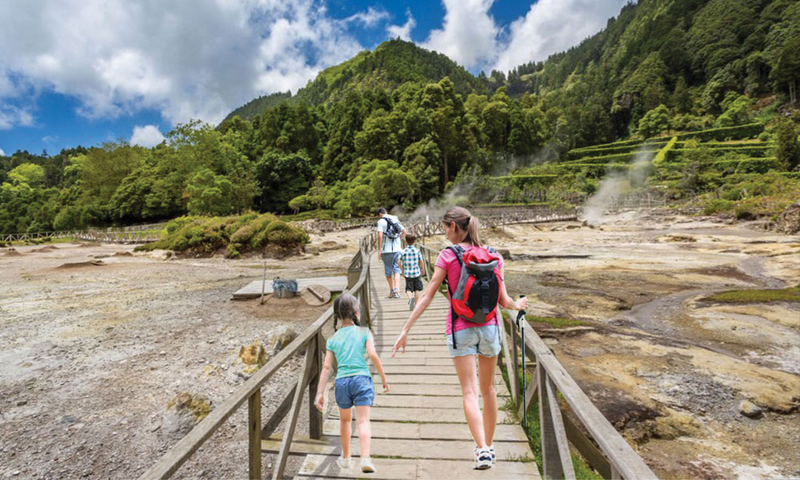 Feel the Macaronesian landscapes (a modern name for several groups of islands of volcanic origin in the Atlantic Ocean, off the coast of Europe) as you venture off to the beautiful west side of São Miguel Island. In this journey you will discover the legend of eternal love, the story of the blue and green lagoons. The arrival at Sete Cidades will be metaphorical, where you will cross the tunnel and fall into the green lagoon with special natural musical sounds. 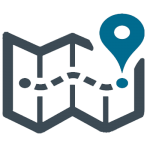 Return to your hotel, dinner and overnight. 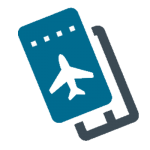 After breakfast, check-out, transfer to the airport for your flight. End of our services. *Itinerary may be inverted but services remain the same. *Watching more adventure/ outdoor activities? Ask us to add whale watching excursion, rock climbing, biking, hiking, canoeing, diving or cave rappelling.